They say time heals all wounds and I am happy to say that Kevin of Natural Gut Wholesale and LoveSetMatch have made amends and are now working together again. It’s crazy that in our small tennis world there should be any animosity so I am glad that all tension is gone and I am endorsing the company and strings once again. Kevin has gone out of his way to support our tennis program in Azusa and sponsored our last USTA event and he has also sponsored our TennisPAL Chronicles Podcast as a show of good faith. I recommend you support Natural Gut Wholesale and feel confident that they will rectify any issues you might have with their strings or quality control if there is one. I am currently playing with the Version 5.0 of their string in a hybrid combination with Babolat RPM with great effect. I have one racquet with the Natural Gut Wholesale hybrid and one racquet with the Wilson Gut hybrid and feel very little difference in using both strings. I also have not broken any strings since playing and it’s been approx 2 months in this configuration although I did take a couple weeks off due to work. I am happy with the feel of the natural gut wholesale string and recommend you give it a try. I think you will find that it is a great string at a great value. I can’t speak to the quality control of Natural Gut Wholesale as I have only tried one set of Version 5.0 but thankfully I have only had to try one set which is saying something compared to the issues that I had in the past. I must also state that I use string savers in a hybrid combination since I use Gut as the mains and the poly typically chews right through the gut if you don’t use string savers. I have tried many different kind of string savers and I really can only recommend the babolat ones. I will put a link here for you to try them for yourself. I would love to hear your feedback about this string if you use it or decide to try it. Please leave a comment below and thanks to everyone who emailed me and asked questions about this company during my trial period. I do work hard at presenting products in an honest and transparent way so you can make an unbiased decision. I was previously trying out the Natural Gut Wholesale brand from Kevin Smith naturalgutwholesale.com located in Chula Vista California. I believe the string comes from India and NGW is just a reseller. I will simply post his awful emails regarding my experience with this company to let his words speak for themselves. If you want a detailed explanation of the dealings I will share it with you but it saddens me deeply to see anyone so awful involved in the business of tennis. I will say that I purchased 3 sets of strings from them in this transaction and previously purchased many sets in the past. Both sets of strings broke before one ball was hit. The string he is making is defective. I sent the third set of unused string back to him on my dime because my stringer refused to waste any more time with his string. I called around Los Angeles to ask a few master strings in LA if they would string the racquet and as soon as they heard “Natural Gut Wholesale” they refused because they knew the string was defective. When I asked for a stringer in Los Angeles who would string his product, he could not produce one. When I asked for a refund in ranted that I wanted free product. I asked for a refund in August of 2017 and tracked the package I sent to him but here we are in Nov 2017 and I still have not received a refund. Only ranting emails. My passion for tennis runs deep and I only post this as a cautionary tale of the type of customer service you might receive from this company. Beware! “I don’t care if you have 1 million followers. I also have tens of thousands of followers too and business is growing 4 fold every 6 months and it will continue to grow 4 fold because I don’t have these issues with anyone else. It has been impossible to satisfy you and your stringers are pathetic. For someone who has a tennis blog and you cannot even find someone to string your racquets is pretty pathetic and I would be quite embarrassed. This is coming from a top ATP professional, national champion, full ride division 1 scholarship player, very successful business person, someone who “personally has strung thousands of racquets, and I have connections every where. I have read your blogs and personally I think they are a joke and completely negative. Most players knowledgeable players do not even read all that negative BS nor believe it. READ MY FEEDBACK 2300 PERFECT AND WE ARE THE HIGHEST RATED! This is just a very small fraction of my sales. Just a fraction. Why?? Because we do not have fake customers that continuously harass complain like yourself and want everything for free. Never heard of someone stringing so many racquets with so many issues that cannot even find tennis stringers that know what the heck they are doing. Best of luck to you and now you can watch us continue to grow and pay full dollar for your gut that is not any better than our top rated gut. Only a fool pays $40-$60 for natural gut that is the same basic string. No one so many top players and professionals are now using our gut. NEXT TIME SEND THE CORRECT TRACKING # AND HAVE STRINGERS THAT CAN STRING RACQUETS. PATHETIC AND EMBARRASSING IF YOU ASK ME! I will make sure everyone I know realizes that your blog is full of BS in which most I am sure already do. “Unfortunately a few small select few stringers love to charge their customers enormous fees and only string $50 guts to promote their own business and overcharge their clients. It is awesome that we do not do this as we make strings affordable for everyone. It is too bad that you failed to see this greatness of our company, but then again you chose to take your racquets to a specific stringer. Actually quite surprising for someone who has a fairly large following. You would think they would have more knowledge of tennis and stringing racquets??? Hmmmmm. I will also make sure to post that your website is full of flaws and run by someone that knows very little about tennis and stringing racquets because it is obvious that you have little knowledge of the process. NO WONDER WE HAVE OVER 2300 PERFECT EBAY RATINGS!! HMMMMMmmmmmm does this say anything about our customer service?? Maybe you should take a look at your review processes and your knowledge of tennis and racquet stringing. You have ZERO effect on our sales. In fact this past month they have been so high that we can barely keep our strings in stock. Why? Because we make the BEST natural gut money can buy. Our service is second to none. Your website is full of flaws and false review processes. I mean come on? What person cannot get his own racquet strung? No one else seems to have these issues! Have a wonderful day as the skies are sunny and business is booming and we will continue to boom and expand as we have thousands of awesome repeat customers that I will always take great care of and go the extra mile. My first attempt at ordering this string off Ebay, I tried 5 sets of the 15 gauge string and the string did not even fit in the portholes of my tennis racquet. It was more like 12 gauge string. Quality control is severely lacking. Do not support this company like I tried to do, you will only get burned by the defective product and ill-mannered customer service. I want to personally address the negative comments from LoveSetTennis. As everyone knows customer service is most important to us and please do not for one second take this particular intentionally fabricated and heavily manipulated incident as a reflection upon 99.999% of all interactions with customers. All customers are treated with utmost respect and appreciation and in no means does this falsely made up accusation reflect the overall company. Most importantly I want everyone to know if a string happens to have a defect (happens about 5% of the time with ALL natural gut companies) we always replace string no questions asked and we always strive to make sure EVERY experience is as positive as possible. We simply cannot replace string that is strung many lbs over suggested tension and definitely not after several months of use. No company is going to do it and EVERYTHING this ONE PARTICULAR customer asked was either fraudulent or just plain not making logical sense. Why? Because I think they run some Blog that is nothing, but negative boring, off subject, nonsense and want products freely given to them simply because the customer has a blog and they know they can personally attack small companies and get away with it IF NOT given FREE products. Paypal 99% of the time will side with any customer on purchase protections. I think this policy is awesome and they should as customers are #1. I want you to know he was the less than 1% that LOST his dispute!! Why? Because even though we would never let something get this far over 2 sets of string, his constant demands for FREE strings because he has a blog was ridiculous and we could not help him. We cannot just give away string for his illogical and really what were demanding fraudulent requests. Paypal also found him fraudulent and wrong in his demands and he only shows 1/3 of his personal attack emails. Yes at this point we should have handled it differently because even though what was just a set of strings went way too far. We have a perfect 100% customer rating on EBay alone for a reason and thousands of REPEAT customers. Please do not let this less than .00009% of experience deter you from using our strings as I guarantee you will find our customer service 1st class and in full support of our customers. Try the string for yourself and you will see. Email or call us anytime and you will find out we are here for you to help. I do not think anyone has better customer service. Our strings are top tier quality and they will continue to improve until we are what I’d like to say the best with the most reasonable prices. (so many lies I don’t know where to start – I paid for the strings I didn’t ask to have them for free which is why I was seeking a refund). 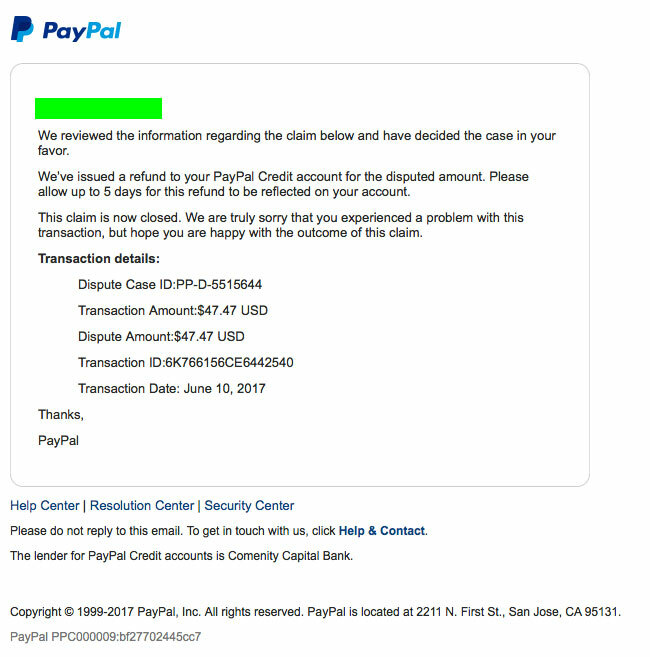 I also want to mention the link you have posted was a customer that lost a totally ridiculous dispute with Paypal which would normally 99+% of the time side with any customer and was totally wrong and lost. I can also provide the “proof”. I do not even know how he can run a blog, but then again it must not be that difficult. Big learning experience for us on this one, but he was wrong and DID lose. The lousy interaction was unfortunately based upon principal instead of reality. Oh well but I guess over 5,000 perfect 100% feedback ratings should speak volumes right? Write this one off as a learning experience, but we will do better. LoveSetMatch Tennis…..as soon as we return from another very successful marketing and business trip tomorrow night I am going to post the real truth about how we were deceived and lied to by this ONE particular individual and the email Paypal showing he lost the dispute and how he continues to brag and harass our very successful company. It’s really shameful that just one individual is so adamant about 2 sets of tennis strings that he has to continue making up lies and post all over the internet. This should prove that everything he is saying has zero relevance or zero merit of our company. Personally, I believe he just trying to draw attention to his failing and faltering blog. I mean come on what individual goes around and posts all this stuff about 2 sets of tennis strings they actually used for extended periods of time, strung too high above suggested tension, claims they cannot even find stringers in a multi million population area (doesn’t even string racquets) yet runs a negative tennis blog with little relevance and importance to the actual tennis world?? EVEN THOUGH THEY LOST THE ACTUAL FRAUDULENT DISPUTE PRIMARILY BECAUSE WANTING FREE STRINGS HAD WE KNOWN SOMEONE WOULD USE THIS AS ADVERTISING THEIR FAILING BLOG WE WOULD HAVE HANDLED IT DIFFERENTLY and yes a positive learning experience for us because our ACTUAL customers and their overall satisfaction are of the utmost importance to us. EBay rating now approaching 3,000 perfect ratings speaks volumes and again shows why his blog should be shut down and done away with once and for all. wow isn’t this crazy?? I can’t believe how many lies he wrote in all that ranting. Kind of makes me laugh. 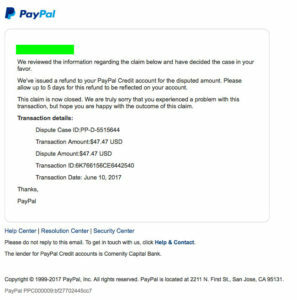 Here is an image from the refunded paypal transaction to show that he is completely lying again and he lost the case against his company. This was issued 5 months after my purchase and I did try to give the company a chance to make it right before going through Paypal, but you can see what kind of responses I received. I mean why not just refund your customers and say sorry instead of going through all this drama? So weird. ← Happy Birthday Roger Federer ! Sacrifices are needed to succeed!